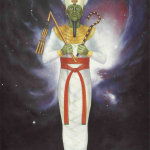 Osiris and his Twin Flame ISIS are Hierarchs of a Sun in our system of worlds. They are Beautiful Cosmic Beings of 100% Light and they will be coming back into the Awareness and consciousness of mankind in a wonderful and beautiful Way. Osiris, Lord of the deep – helps us to let go of our attachments, let go of our illusions, let go of being human so that we can Be Divine. 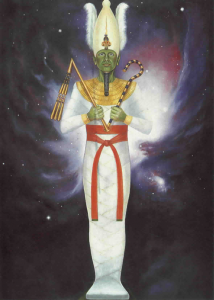 Osiris is the Chohan on the 9th Secret Ray of Meditation and Enlightenment, along with Beloved ISIS. Osiris can help us connect in meditation to the worlds beyond the third dimension and truly to walk through the darkness so that we can be All Light. Osiris can help us face the darkness that we’ve been unconsciously hiding beneath our outer awareness, those parts of ourselves that may act out from time to time and cause us or others suffering. Our human ego may justify them or explain them away, and yet the Christ within knows the Truth. Our inner child cries out for Healing, Protection, Love, Freedom and Osiris can help us to look at and See that which is binding us to the lower consciousness, to the pain and suffering, and to the lack and limitation. There is no such thing in God Reality. Life is Abundant and you are now tasked with demonstrating the Abundant Life for All to See. Osiris helps us walk the Way of surrender. Walk the Way of Being True to our Self. Walk the Way of Being dependent only on our God Self to provide for all of our needs and god desires. We have all we need within us, and within us is all that IS. Yet we must fully move Be-yond the outer mind and into the inner recesses of our Hearts to Truly fulfill our calling to Be the Most Beloved, to walk and talk as our brother Jesus did – as One who’s Father Mother within doeth the work. Rise Osiris resurrect, diminish the illusion of death, we ask that you unlock the gate, unto you whose truth up holds great weight. This line above is from the Decree to Osiris, which Osiris released to help us get in touch with his magnificent flame and to surrender all of our pain into the arms of the lord of the deep and the Divine Mother so that we can truly be made whole again. As we heal and take back our Divine Power, Love and Wisdom, so we Heal the World with Osiris and the Ascended Hosts of 100% Light! Osiris has a very unique flame which you will begin to feel as you connect with him. There are many vistas of Light to explore here. Sometimes he will appear as a Green Flame or at least in this Feeling. Follow your own Heart and find the Way of Beloved ISIS and Osiris to meditative understanding, knowing and bliss of Being who you Are! Love made Manifest!